We read with interest the case report by Soforo, et al1 and thoughtful accompanying editorial by Jacob and Jacob2 on anti-tumor necrosis factor (TNF)-induced systemic lupus erythematosus (SLE). They suggest that TNF is proinflammatory in certain disorders and blockade is therapeutically useful, whereas in other disorders, like SLE, it has an immune regulatory role, and blockade can be detrimental2. Anti-TNF treatments are known to induce autoantibodies, particularly antinuclear antibodies (ANA). Hence it is important to check for ANA before initiating anti-TNF treatments. Jacob and Jacob2 have advanced the discussion by mentioning the influence of HLA class II genotype on TNF inducibility. Caucasians possessing HLA-DR3/DR4 have higher levels of TNF in response to activation as compared with subjects who are DR2/DQW1-positive (mostly non-Caucasians) who have lower TNF inducibility3. We describe a patient that developed a rare variant of cutaneous lupus erythematosus several years after anti-TNF therapy for rheumatoid arthritis (RA). Our case reveals the importance of HLA class II genotyping assessment. A 58-year-old woman with a 12-year history of seropositive RA experienced disease progression despite use of triple disease modifying antirheumatic drugs (DMARD) hydroxychloroquine, sulfasalazine, and methotrexate (MTX). In April 2000, she was recruited into a phase IIIB drug trial to assess efficacy and safety of etanercept in RA in a different hospital. She received 177 injections of etanercept 25 mg twice weekly up to November 2001 and experienced a gratifying response to this therapy. The drug trial was halted in her case due to otorrhea, and was not continued in spite of negative findings on evaluation of ear, nose, and throat. After this the patient was followed up in our clinic for RA. The triple DMARD therapy was restarted, but the Disease Activity Score remained above 5 in spite of adjustment of DMARD doses. In the last 3 years she was maintained solely on low-dose oral MTX. She had had hypertension starting from 2006 and her blood pressure was controlled on a combination of bisoprolol and amlodipine. In 2008, she was diagnosed with Type 2 diabetes mellitus; her glycemic status has remained under control with metformin. In July 2009, she developed a few erythematous indurated plaques without epidermal changes on the neck and exposed midriff area typical in Indian women and on the back (Figure 1). Skin biopsy histopathology showed moderately dense superficial and deep perivascular and periappendageal lymphocytic infiltrate with dilatation of capillaries in the upper dermis and abundant deposits of mucin in the reticular dermis. The dermoepidermal junction and epidermis was relatively spared by the infiltrate and the epidermis was slightly flattened (Figure 2), and this was consistent with lupus erythematosus tumidus (LET)4. She showed no evidence of systemic involvement. Serological evaluation revealed a homogenous fluorescent pattern of ANA on Hep-2 cells with low titer (1:160). Her ANA status prior to etanercept therapy was unknown. Anti-dsDNA antibodies, SSB-La, Sm, Jo1, Scl-70, U1, SnRNP, and antihistone antibodies were negative, while SSA-Ro antibodies were positive by enzyme immunoassay, 187 RU/ml; anti-cyclic citrullinated peptide (anti-CCP) antibody test was positive by chemiluminescence, 77.7 U/ml. Complement levels, hemogram, urinalysis, and liver and kidney function tests were all normal. Radiographs of both hands and feet showed no bony erosions. HLA class II genotyping for DRB1*DQB1* was performed by polymerase chain reaction low and medium resolution sequence-specific oligonucleotide assay; the results were as follows: DRB1 generic typing, DRB1*03XX and 15X; allelic typing, DRB1*0315, DRB1*1510, DRB1*0105, DRB1*0111; DQB1 generic typing, DQB1*02XX and 06XX; and allelic typing, DQB1*0202, DQB1*0601, 06012. Characteristic skin lesions of lupus erythematosus tumidus: erythematous indurated plaques without epidermal changes on the patient’s back. 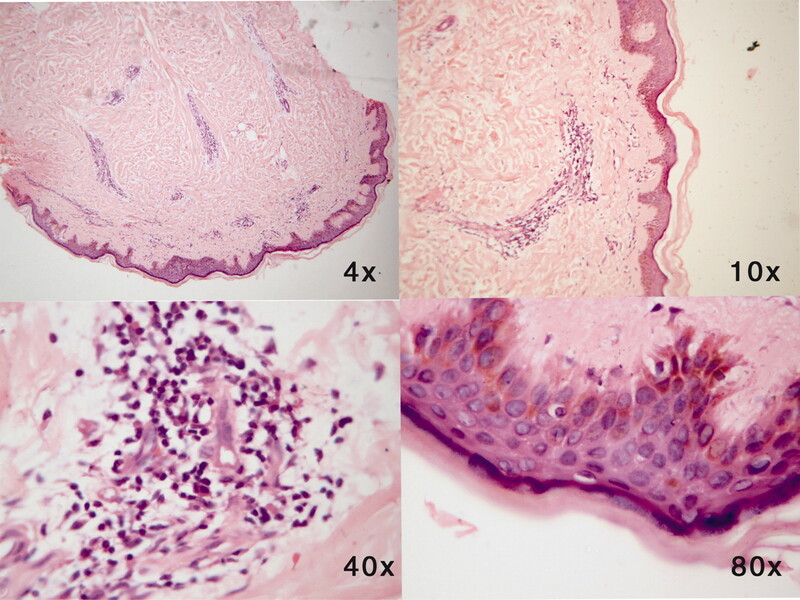 Histopathological features show dense superficial and deep perivascular infiltrate and deposits of mucin in reticular dermis (H&E stain). Before restarting hydroxychloroquine, an ophthalmologist noted normal intraocular pressure in both eyes and fundus examination was normal. Schirmer test showed 2-mm wetting right eye and 1-mm left eye. She received hydroxychloroquine 400 mg/day and cyclosporine eyedrops with artificial tears, and continued on low-dose oral MTX. When last seen in September 2010, the erythematous plaques had disappeared after 6 months of hydroxychloroquine along with measures for decreasing sun exposure, and her RA disease activity remained low. A recent study assembled a population-based incidence cohort of adult subjects first diagnosed with RA between 1955 and 19955. These patients were followed for several decades. The study concluded that SLE features were common in RA, given sufficient observation time. Hence 3 possible explanations were considered for development of LET in our patient. First, LET may be associated with therapy for RA, particularly etanercept. In establishing a relation between the use of a drug and the occurrence of a dermatological condition, various factors must be considered. Information on clinical and histological patterns, time and dose relationship, dechallenge and rechallenge, and analogy with previously reported cases can provide support in assessing the plausibility of such a relation. The underlying disease and concomitant medication also need careful consideration, as they can provide alternative explanations6. Drug-induced LET has been reported in 3 cases. One patient with RA developed LET after 13 infusions of infliximab7; the second case of LET was induced by thiazide diuretics; and the third occurred as a manifestation of immune restoration following initiation of highly active antiretroviral therapy (HAART)8. The drugs noted in the second and third case reports were not used in our case. In our patient, LET developed 8 years after stopping etanercept and rechallenge with the same would have established that LET in our case was etanercept-induced, but the patient did not consent to rechallenge. Second, our patient represents a subset of “rhupus syndrome,” which is a true overlap between RA and SLE or a variant of either condition. There are 3 biological markers that are hallmarks of RA and also present in rhupus, but not in SLE5. These are (1) anti-CCP antibodies; (2) adequate C-reactive protein response; and (3) genetic risk profile of RA including gene variants TAP*0201 and TNF-308A, which occur in the same region as the shared epitope and increase the susceptibility risk for multiple autoimmune disorders. The first 2 markers were present in our case. The third explanation is that LET may have developed de novo and may be a coincidental occurrence in our patient. We believe the second explanation is applicable in our case. Our patient with “rhupus syndrome” showed a gratifying response to etanercept, but developed LET 8 years later, with positive SSA-Ro antibodies. Her HLA class II genotyping revealed DQB1*02 and DRB1*03, a well established association of anti-Ro antibodies10. Ultraviolet B light (290–320 mm) is an exogenous trigger that is most often responsible for skin lesions of cutaneous LE, particularly subacute cutaneous (SCLE) and cutaneous neonatal LE. Besides being characterized by remarkable photosensitivity, LET also has a positive correlation wih SSA-Ro and SSB-La antibodies as described in SCLE and neonatal lupus8. Our case highlights the efficacy of anti-TNF treatment in rhupus syndrome, but controlled clinical trials with prolonged followup are needed to determine the safety of TNF blockade in overlap syndromes.
. Induction of systemic lupus erythematosus with tumor necrosis factor blockers [letter]. J Rheumatol 2010;37:204–5.
. On anti-tumor necrosis factor-induced systemic lupus erythematosus [editorial]. J Rheumatol 2010;37:3–5.
. Heritable major histocompatibility complex class II associated differences in tumor necrosis factor alpha: relevance to genetic predisposition to systemic lupus erythematosus. Proc Natl Acad Sci USA 1990;87:1233–7. Tumid lupus erythematosus: Criteria for classification with immunohistochemical analysis. Arthritis Rheum 2003;49:494–500. Systemic lupus erythematosus features in rheumatoid arthritis and their effect on overall mortality. J Rheumatol 2009;36:50–7.
. Dermatological conditions during TNF-α-blocking therapy in patients with rheumatoid arthritis: A prospective study. Arthritis Res Ther 2005;7:R666–76.
. Infliximab-induced lupus erythematosus tumidus in a patient with rheumatoid arthritis. Arch Dermatol 2006;142:115–6.
. The 100th anniversary of lupus erythematosus tumidus. Autoimmun Rev 2009;8:441–8.
. Overlap between systemic lupus erythematosus and rheumatoid arthritis. Is it real or just an illusion? [editorial]. J Rheumatol 2009;36:4–6. Genetic association of cutaneous neonatal lupus with HLA class II and tumor necrosis factor? : Implications for pathogenesis. Arthritis Rheum 2004;50:2598–603.